NETWORK FINALS: The HOWIE MANDEL ALL-STAR COMEDY GALA lost 0.1 in final numbers. CABLE HIGHLIGHTS: There was no doubt what NBA game TNT viewers wanted to watch on Monday, as the Cleveland vs. Golden State match-up was at a huge 1.81, with Oklahoma City vs. Clippers relatively tame at 0.74. On VH1, LOVE & HIP-HOP grew by two-tenths to 1.32, LEAVE IT TO STEVIE climbed 0.08 to 0.91, K MICHELLE MY LIFE was up 0.07 to 0.75, and AMERICA’S NEXT TOP MODEL slipped 0.03 to 0.49 (the latter was also simulcast by MTV–see below). USA’s WWE telecast was at 1.23/1.10/1.08, compared to last week’s 0.99/0.99/0.92. On Discovery, the season premiere of FAST N LOUD was at 0.93, and the season premiere of DIESEL BROTHERS was at 0.78. On MTV, TEEN MOM jumped 0.25 to 0,83, followed by the simulcast of AMERICA’S NEXT TOP MODEL at 0.29. On Bravo, VANDERPUMP RULES rose 0.06 to 0.57, lead-out SUMMER HOUSE was down 0.12 to 0.25, and lead-in TIMBER CREEK LODGE was up 0.03 to 0.20. Nickelodeon’s early-evening RUFUS hit the Top 15 at 0.52. On Food Network, KIDS BAKING CHAMPIONSHIP gained 0.17 to 0.51, and CAKE WARS was at 0.36. The conclusion of ID’s IS OJ INNOCENT was at 0.48/0.46. Disney Channel’s 9AM MICKEY & THE ROADSTER stayed strong at 0.42/0.39. 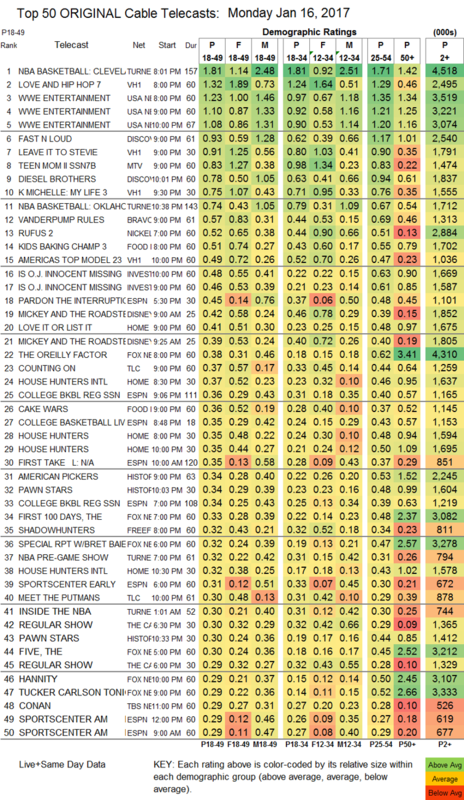 On HGTV, LOVE IT OR LIST IT climbed 0.09 to 0.41, HOUSE HUNTERS INTL was at 0.37/0.32, and HOUSE HUNTERS was at twin 0.35s. TLC’s premiere of COUNTING ON was at 0.37, followed by the premiere of MEET THE PUTMANS at 0.30. History’s AMERICAN PICKERS was at 0.34 and PAWN STARS was at 0.34/0.30. 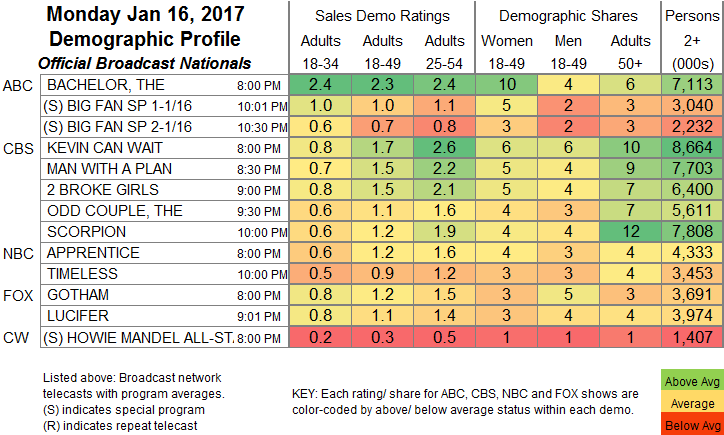 Freeform’s SHADOWHUNTERS rose 0.04 to 0.32, and BEYOND fell 0.03 to 0.14. Nat Geo’s STORY OF GOD returned at 0.24. Night 2 of HBO’s YOUNG POPE fell 0.11 from Sunday to 0.19.